A U G U S T 2 0 1 5 O U T P A T I E N TS U R G E R Y. N E T 6 3 What initially drew you to orthopedics? Growing up, I was an athlete and an artist. The concept of using my skills as a surgeon to help someone through restoring physi- cal ability was conceptually very appealing. The mechanics and creativity of orthopedic surgery appealed to both the athlete and artist in me. What's most satisfying about complex joint replacement? The precision of the surgery, the applied physics used in the instrumentation and implants, and the dramatic results. Hip and knee replacement are among the most successful surgeries in alleviating pain and improving qual- ity of life. I also love the challenge of revision joint replace- ment surgery. The most difficult cases allow me to fully uti- lize my medical knowledge and creativity to solve problems. 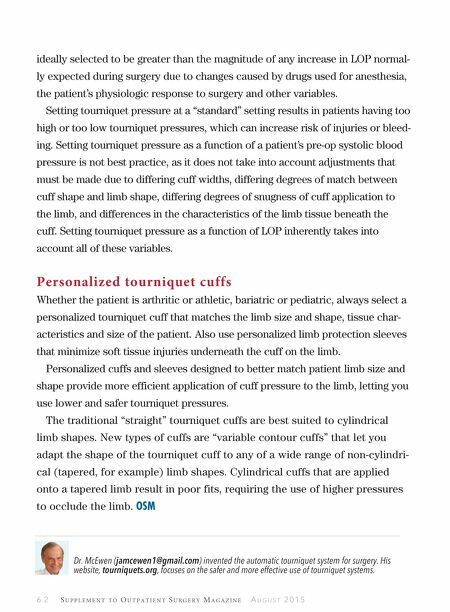 You don't fit the profile of a "typical" orthopedic surgeon. I'm 5'4" tall and wear a size 6-1/2 glove. I don't have difficulty using orthopedic instruments. The instruments are my friends. I have learned how to use them maximally to complete the most physically or technically challenging parts of surgery. 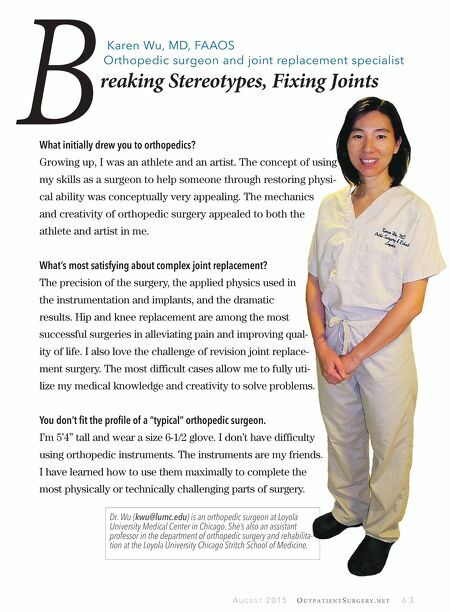 Karen Wu, MD, FAAOS Orthopedic surgeon and joint replacement specialist B reaking Stereotypes, Fixing Joints Dr. Wu (kwu@lumc.edu) is an orthopedic surgeon at Loyola University Medical Center in Chicago. She's also an assistant professor in the department of orthopedic surgery and rehabilita- tion at the Loyola University Chicago Stritch School of Medicine. Are You Getting the Most Out of Your C-Arm?